With inspiration from a Pinterest board full of urban and industrial abstract art from within New York's City's finest, I knew exactly what approach I wanted to take with Sarah & Alex's invitations. With a taste for a minimalist art board, I knew Sarah & Alex would love clean, crisp, and modern typography, negative space, and a touch of messy. I used a brush paint splatter design element throughout the invitation, keeping most of the focus on the clean and crisp layout. 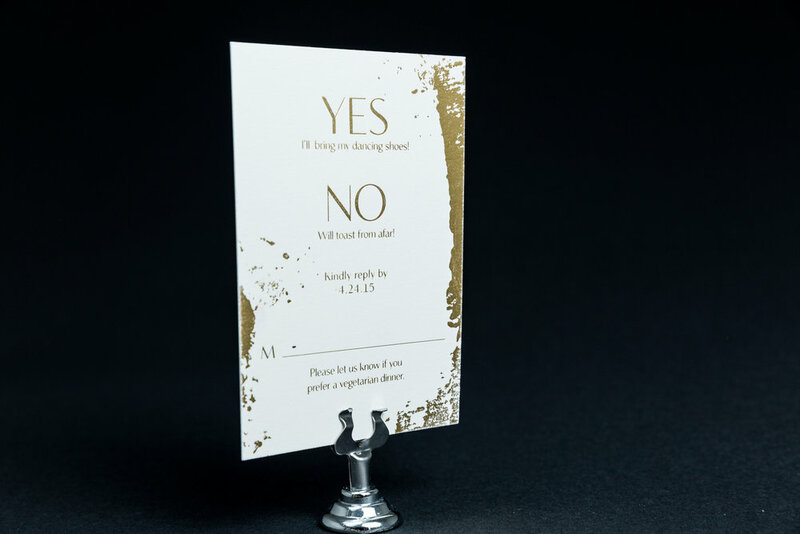 The invitation suite was fully foil stamped in gold onto a soft cotton card stock that was ultra thick. The envelope liner and RSVP envelope are a bold burgundy color with foil stamp detailing.